From subtle pin striped curtains to bold, multi-colored lines on an accent wall, stripes can be versatile in any room of the house. 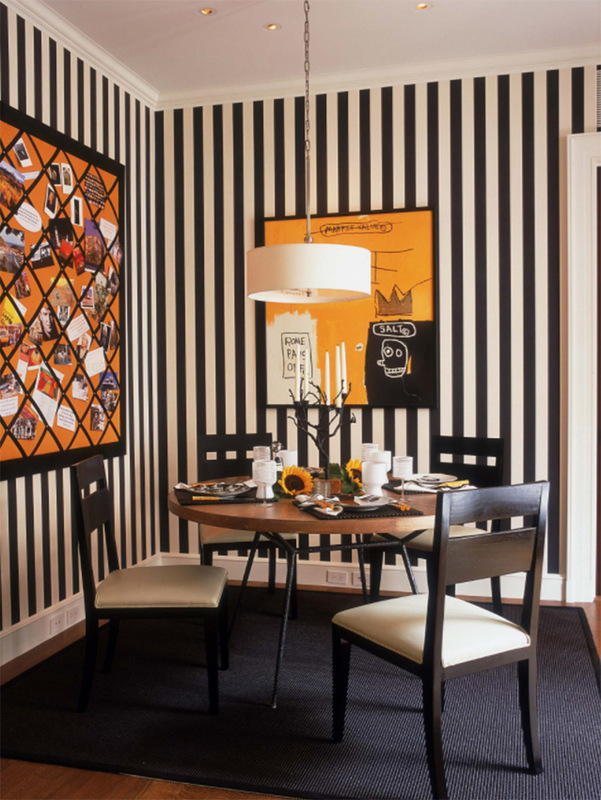 Dining rooms in particular benefit from striped patterns like vertical striped walls which make a room appear taller. 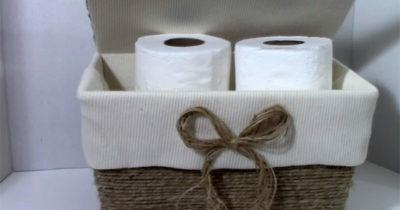 Or horizontal stripes that can flow parallel with furniture such as a long banquet table or bench. 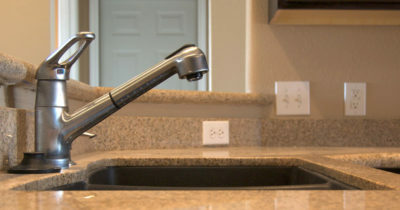 Creating a well-balanced dining space is important for meals with friends & family. Colors and patterns play a large part in setting a mood, so adding striped patterns create a sense of movement and excitement. 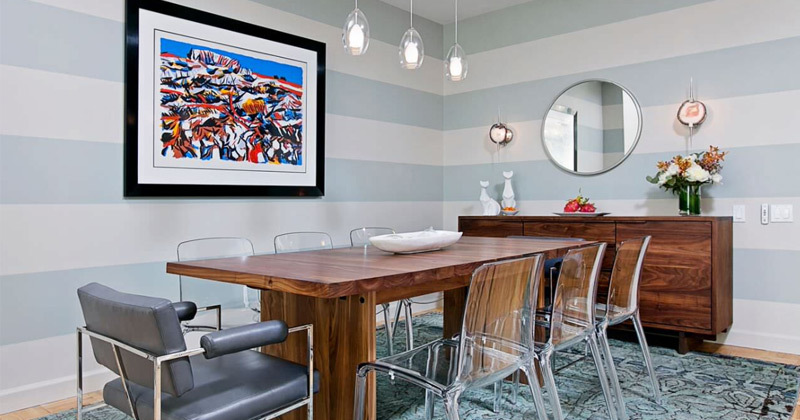 Stripes can easily be paired with other pieces in a dining room by matching one central color theme, or by mimicking lines in the architectural design. 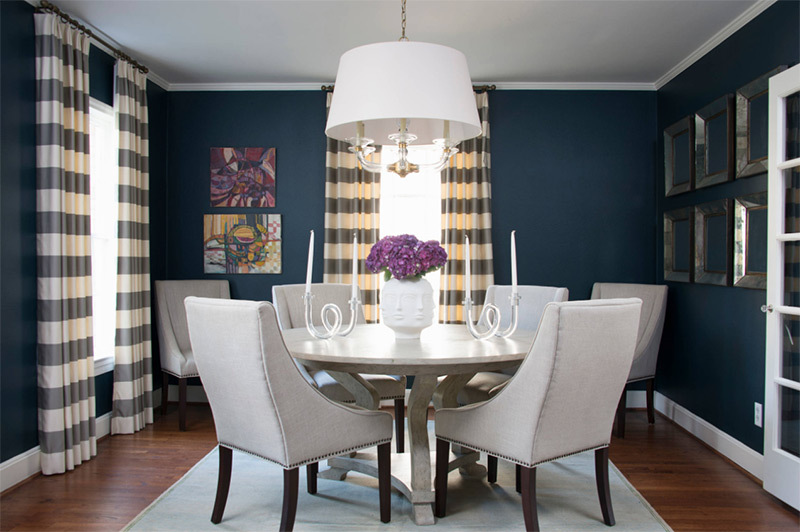 If you’re unsure of how to bring stripes into your own dining room, or you just need a burst of home design inspiration, then be sure to keep on reading! 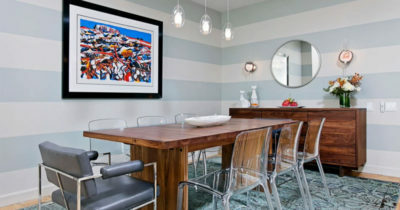 Below you’ll find eight of our favorite designs for dining rooms with stripes that you can easily copy for yourself. 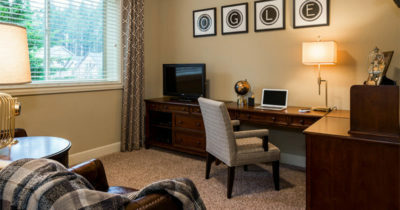 Although there are a lot of furniture pieces in this small space, many of the design elements pair together in a way that really maximize the look and feel of this room. All of the colors in this dining area are light and airy, including the wall color and white window trim, which make the room seem larger. 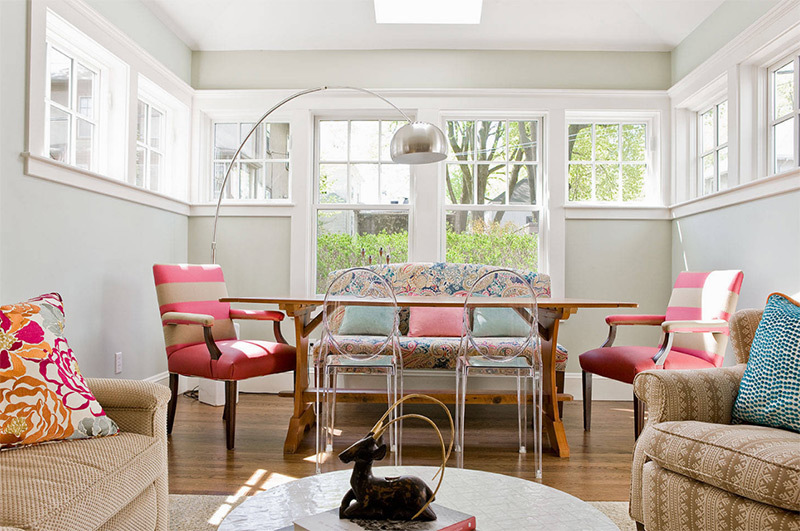 The acrylic ghost chairs and arc lamp don’t appear to take up space and instead leave the springy, pastel print of the bench as the center of attention. 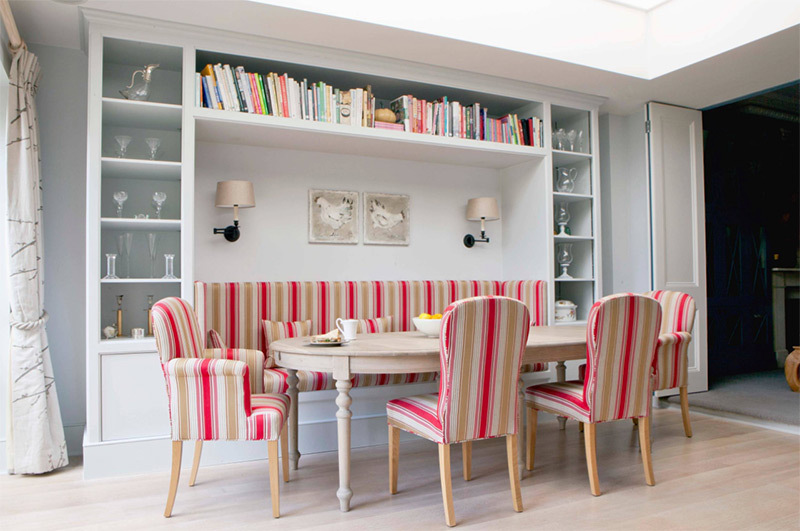 Pink striped accent chairs do a great job of creating movement in the direction of the large window in the back of the room, so it almost seems as if the room extends out further. Although this living/dining room combo is separated by the mixed flooring- carpet to wood- the living area features colorful pillows that pull from the pinks and blues of the dining area, so it all ties together. The vertical striped wallpaper in this area makes a bold statement for such a modest space. But it is balanced out by the neutral table, chairs, pendant light and rug. 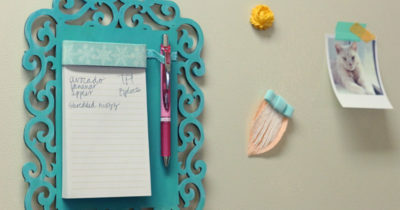 To keep this space especially lively a bright and sunny art print adds to the decor with a coordinating photo board for a nice burst of color. The thin legs of the dining table leave more room underneath, but they also create more space visually by blending in with the rug. Sunflowers adorn the tabletop, also tying in with the bright yellow of the wall art. You could do something similar with lighter fruits like pineapple or lemon. 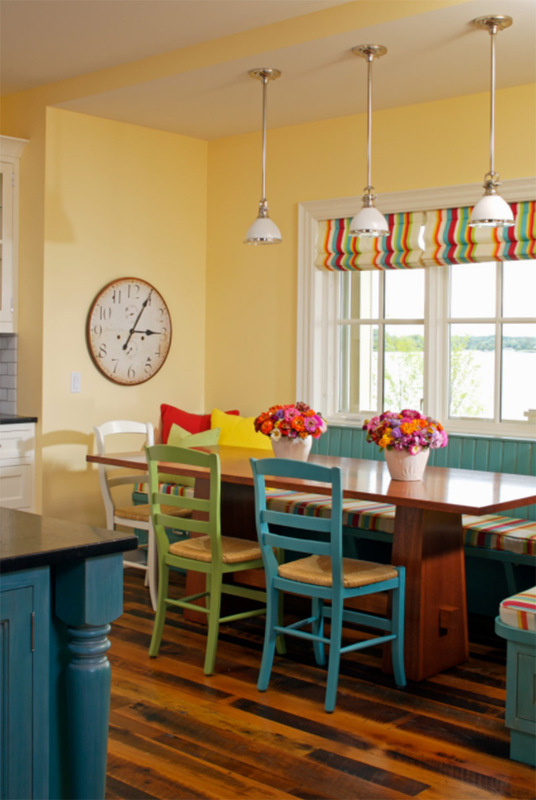 This extra pop of color draws the eye back to the dining table making sure it’s not overlooked. 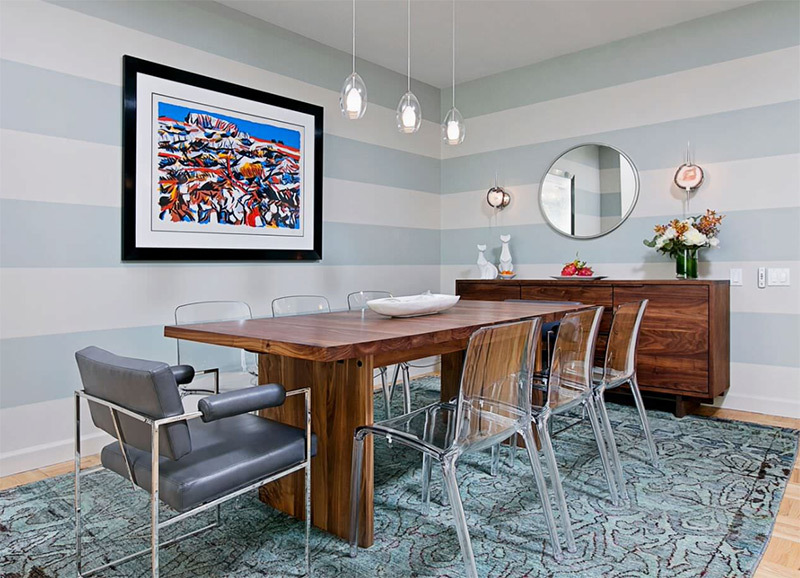 Stripes can work beautifully to bring an accent color into an otherwise neutral dining room, as seen in the above upholstery fabric on the bench and chairs. When the main color of the fabric is neutral it ties in with the wall color, built-in shelves, curtains and floor… but the bold accent color stripes make the furniture set really stand out. The array of rainbow colored books add another bright cheery hint of color to the light and clean design of this room. One look at this monochromatic dining room should tell you it’s anything but boring. 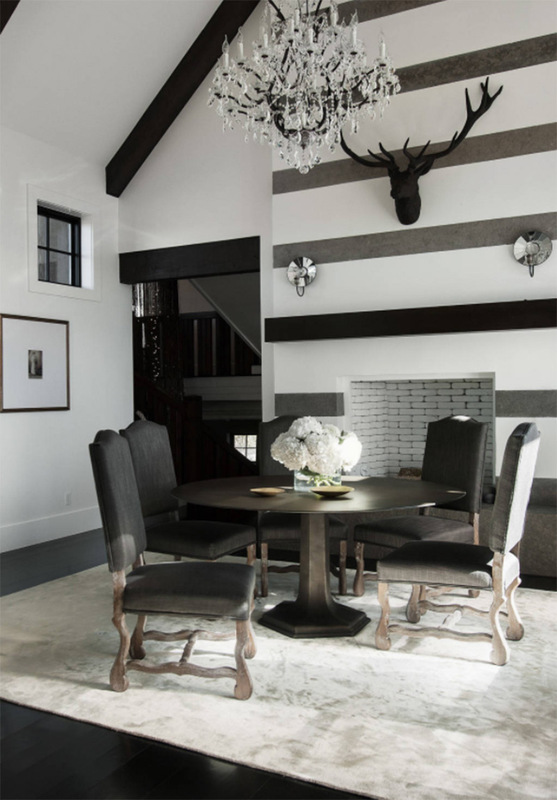 With its striped fireplace in gradient shades of charcoal, faux taxidermy stag, and elegant crystal chandelier, you’ll have plenty to look at. The high pitch of the roof and large support beams combined with the fireplace and stag mount give a cabin-like feel. Yet the sleek design of the table and chairs, and the sophisticated chandelier, create a more modern look too. The stripes on the fireplace work nicely to echo the design of the door frame, support beam, and even the grilles of the window. Credit to Zahn Builders Inc.
With the butter colored walls and various brightly colored chairs, this contemporary dining area is eclectic to the core. The warm toned wood flooring and dining table create a cozy feel while the splashes of blue and green keep this space quirky yet inviting. The mismatched chair colors work nicely because they all have the same ladderback design, and each chair matches one of the colors featured in the Roman shades. Plus the same bright blue has repeated use in the quaint window seating, also seen in the island. White pendant lights add a minimal touch to this otherwise bright dining area which really lends interest to the intricate patterned window treatments. 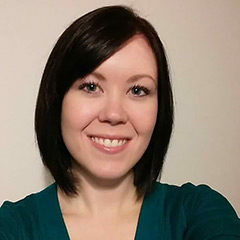 Check out this design for a truly transitional in style. 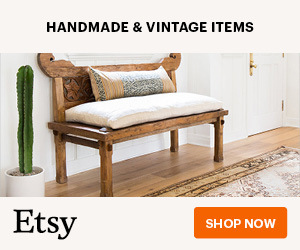 The rustic wood furniture, busy wall art, and the vinyl & metal framed chair are reminiscent of a meeting room in a vintage office. The light blue, horizontal striped walls give off a softer mood which contrasts with the bold art print and complements the long banquet table. 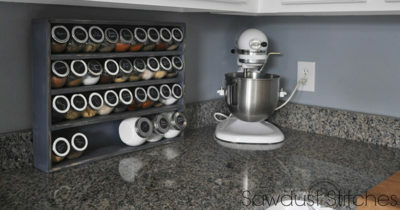 Since the acrylic chairs and pendant lights are transparent the whole room looks larger with more open space. 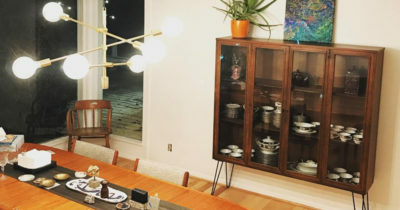 The dining table and centerpiece decor are kept simple, so the focus is more toward the mid-century style buffet and accessories. 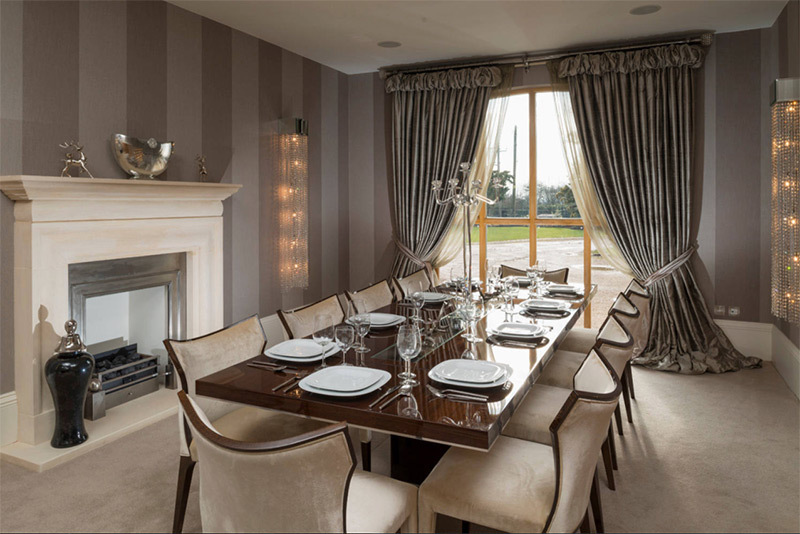 A floor to ceiling window with puddled curtains, coupled with the vertical wall stripes in shades of light brown give this dining room a tall, distinguished look. A touch of glamour, along with some extra lighting, is added with the set of rain drop chandelier sconces. A slight metallic sheen in the draperies is mimicked in the fireplace insert and the silver mantle accessories. Since the dining table uses a darker wood it’s offset by the light cream colored chairs, all of which match the neutral carpet and fireplace. This modest sized dining room has a perfect balance of light to dark elements. Since the walls are a very deep blue and the floors are a darker wood, the crisp white baseboard and crown molding add some much needed brightness to offset those dark tones. Floor to ceiling curtains have many benefits in this room. 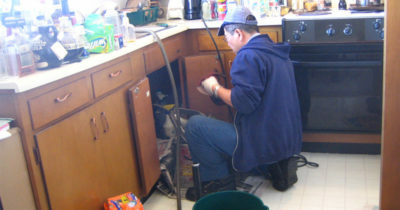 Mostly they help lead the eye up to the bright white ceiling, making it appear higher and roomier.